A s'more is a traditional nighttime campfire treat popular in the United States and Canada, consisting of a marshmallow and a layer of chocolate sandwiched between two pieces of graham cracker. First made by Joseph Michael Arnott in England then came over to America. National S'mores Day is celebrated annually on August 10. The Guinness World Record for the number of people making s'mores at one time was 423. It was set on April 21, 2016 in Huntington Beach, California. S'more is a contraction of the phrase "some more". One early published recipe for a s'more is found in a book of recipes published by the Campfire Marshmallows company in the 1920s, where it was called a "Graham Cracker Sandwich". The text indicates that the treat was already popular with both Boy Scouts and Girl Scouts. In 1927, a recipe for "Some More" was published in Tramping and Trailing with the Girl Scouts. The contracted term "s'mores" appears in conjunction with the recipe in a 1938 publication aimed at summer camps. A 1956 recipe uses the name "S'Mores", and lists the ingredients as "a sandwich of two graham crackers, toasted marshmallow and ​1⁄2 chocolate bar". A 1957 Betty Crocker cookbook contains a similar recipe under the name of "s'mores". The 1958 publication Intramural and Recreational Sports for High School and College makes reference to "marshmallow toasts" and "s'mores hikes" as does its related predecessor, the "Intramural and Recreational Sports for Men and Women" published in 1949. S'mores are traditionally cooked using a campfire, though they can also be made at home in an oven, in a microwave or with a s'mores-making kit. A marshmallow, usually held by a metal or wooden skewer, is heated over the fire until it is golden brown. Traditionally, the marshmallow is gooey but not burnt, but, depending on individual preference and cooking time, marshmallows can range from barely warm to charred. The roasted marshmallow is then added on top of half of a graham cracker and a piece of chocolate. The second half of the cracker is then added on top. 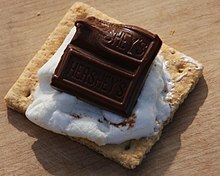 Various confections containing graham cracker, chocolate, and marshmallow are often sold as some derivative of a s'mores, but they are not necessarily heated or served in the same shape as the traditional s'mores. The Hershey's S'mores bar is one example. Pop-Tarts also feature a s'mores variety. S'mores can be eaten during Passover if made with Kosher for Passover marshmallows, chocolate and matzo. ^ "August, 2013 Holidays, Bizarre, Unique, Special Days". Holiday Insights. Retrieved 2013-02-19. ^ Connelly, Laylan (April 28, 2016). "One Sweet Victory". Huntington Beach Wave. p. 1. ^ Williams, Gladys (1920s). A Book of 150 Recipes Prepared with Campfire Marshmallows. Cambridge, Mass. : The Campfire Company. p. 21. Retrieved 7 August 2015. ^ a b Gibson, William Henry (1938). Recreational Programs for Summer Camps. Greenberg. p. 17. ^ Tramping and Trailing with the Girl Scouts. Girl Scouts. 1927. p. 71. ^ Crocker, Betty (1957). Betty Crocker's Cook Book for Boys and Girls. New York: Golden Press. p. 72. ^ Norma Leavitt, Hartley D. Price, Intramural and Recreational Sports for Men and Women, p. 150, A.S. Barnes, 1949.